Our motor home was overdue for a routine servicing…lube, oil and filters. Since we’re full-timers we needed to find a place that was convenient and one that didn’t require us to find accommodations away from our home on wheels. I’ve been reading reports on the various RVing Forums about the experiences others have had at dedicated RV dealerships and what they paid for the services provided. 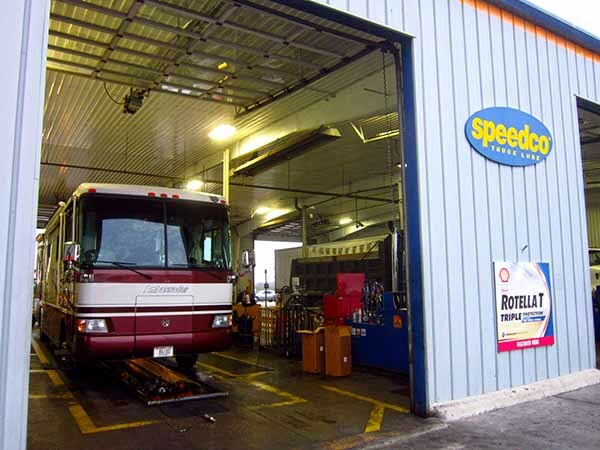 Some mentioned they had great service from Speedco, a quick lube place for big rigs and commercial vehicles. The idea is you get in and out quickly, so I decided to give them a try. We were headed to San Antonio, TX to spend a couple nights and as it happens there is a Speedco just off I-10 on the east side of the city. This had great promise as we could stop in at Speedco get the rig serviced then pop next door to the Flying J for fuel before driving the very short distance to the Alamo KOA where we would be staying. First, upon the recommendations of other RV’ers who have used Speedco, I called ahead to make sure they had the proper filters I needed in stock…they did. We pulled into the Speedco early in the afternoon to find several big rigs waiting in line to get serviced. So we waited…and waited…and waited. Eventually most of the big rigs waiting departed which should have shortened the time for us to get serviced. WRONG! The crew working the three service bays were slow…real slow. They seemed to be lollygagging and standing around more than working on the rigs. Now had this placed been staffed by motivated technicians, this store could be raking in the cash by turning each customer around in quick fashion…nope slow is their only speed here. Many of the local drivers shared their experiences here, but they come back only because of the cost compared to other similar service venues. I had to drop the car off the tow dolly, before pulling into the bay. Once I started into the bay at the technician’s direction, it dawned on him that the engine was in the rear not the front! He wanted me to back out and turn around. Not happening! Besides with all of the rigs waiting behind me, how was that going to happen??? Apparently the designers of the facility didn’t plan on servicing vehicles with engines in the rear, as the oil collection containers don’t travel more than a couple of feet instead of the whole length of the service pit. The tech took my suggestion of lubing the chassis first, then have me pull up and partially out of the service bay on the other side so they could then change the oil and filters. Again they were slow, one crew working three bays simutainiously and only one had ever really worked on RVs or buses. A complication…my motor home has a shield under the motor that protects the filters from debris. They of course were obligated to charge and addition fee to remove this shield. Five 9/16 nuts held it in place. Problem…no 9/16 deep well socket in the whole shop! I had to dig into my toolbox to provide them with the proper tools to remove the shield. It was a bit reluctant to come off, since they didn’t even have any penetrating oil to loosen up the nuts, but they finally got it off…which required me to also supply a pair of wire cutters to cut a zip tie that was used to hold a section of the wiring harness to a loop on the shield. What mechanic doesn’t have a pair of cutters in his toolbox? Nearly an hour to remove five nuts and two zip ties??? I thought things now were looking up, the core of the service could begin. The old filters were removed and new ones put in their place. The oil dirty oil was drained and then…fresh oil. Only instead of the 24 quarts the spec sheet called for the technician put in 36 quarts! OOPS! Now they had to drain the oil again to take it down to the proper level. I didn’t have them reinstall the shield, I did it later myself as I was not pleased with the service thus far, its getting late and its been a really long day. I just wanted to be done, get fuel and get into the KOA before it got any later and darker as storms were moving into the area! The bill came to just a little over $200 for the oil and three filters. They waived the extra charge to remove the shield. Which I guess was their way to offset the rental of MY TOOLS! Others who were there for service were from all over the US and use Speedco often, but said this one was probably the worse one they’ve ever experienced. I will probably never patronize this particular store ever again and before I use another one, I will check with other RVers on their experiences with any I might consider using. One of the procedures they insist on is having you sign a statement that the drain plug, oil filler cap and filters were properly installed and tightened to spec. Yet they don’t let you crawl under (nor would you want to the bays here were an oily mess) to check their work. You also have to verify that the oil was filled to the proper level. This proved difficult since they had overfilled and had to drain oil out. Checking the level of dirty oil is fair easier to read than clean clear oil. During my pre-departure inspection and checks before leaving San Antonio, I found it was a bit low so I topped it off from the spare jug I always carry. Its in Speedco’s best interest to make this store better, as its convenient for those RVers who passing through San Antonio who need such services at an affordable price. Speedco does publish their rates on their website which will help you compare prices before deciding on where to go.